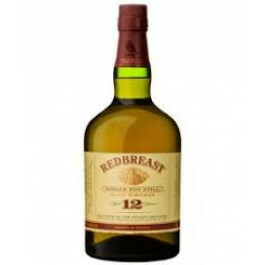 Jameson Redbreast 12 YO Irish Whisky is matured for a minimum of 12 years in a combination of Spanish Oloroso Sherry casks and American oak ex-Bourbon barrels. Like all good pot still whiskeys, it is strongly flavoured and assertive, making it a rare treat for the connoisseur of fine old whiskey and very different to the rest of the Jameson range. This is the only 12yo pure pot still whiskey available. Matured in Sherry casks & Bourbon barrels. 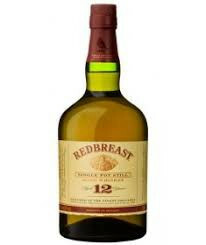 Jameson Redbreast 12 YO Whisky is matured for a minimum of 12 years in a combination of Spanish Oloroso Sherry casks and American oak ex-Bourbon barrels. Like all good pot still whiskeys, it is strongly flavoured and assertive, making it a rare treat for the connoisseur of fine old whiskey and very different to the rest of the Jameson range. This is the only 12yo pure pot still whiskey available. Matured in Sherry casks & Bourbon barrels.